Congratulations! You made it to summer. First order of business: Spend as much time outside as possible—preferably while sipping an icy cocktail and taking in a killer skyline view. 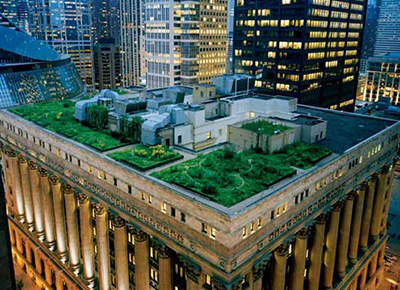 We found 15 Chicago rooftops for doing just that. Cool down with liquor-infused freeze pops and slushies at this chic, clubby penthouse bar. Two fire pits and views of the Hancock building make it a solid place to take your out-of-town visitors. The secluded rooftop is the place to head to escape the chaos of the Mag Mile. Order up some spicy tuna rolls, pork belly steamed buns and sip on some sake as you take in the incredible views (without bumping into any tourists). What’s hotter than new Wicker Park hotel The Robey? Its rooftop pool and lounge—it’s as gorgeous as Soho House minus the membership dues. Hospital visits are rarely something to look forward to...unless, of course, you’re headed to this spot atop Northwestern Memorial. At 16 stories up (and with a Michelin-starred menu), it’s easily the best perch in Steeterville. Take your craft beer-fanatic friends to this Ravenswood hangout for an exhaustive list of bottles and drafts. For a high-low approach, pair a refreshing bottle of sparkling rosé with sloppy joes for lunch. The Victorian-inspired spot is the only one on our list that’s climate controlled; keep it in mind for that mid-July heat wave. Things get really busy on Saturdays, when it’s open until 5 a.m.
No rooftop list is complete without this breathtaking eatery. Picnic tables, craft cocktails and Lake Michigan/Millennium Park views—need we say more? When it’s not quite cocktail hour yet, head to this cheerful neighborhood hangout for daytime beers and brats. It’s a hidden gem atop Lincoln Square’s cutest European market. Rain or shine, a new retractable roof keeps this spot going strong. From the top, you’ll see Lincoln Park and its zoo, the lake, The Loop and, heck, probably your house. You’ve probably heard some of the buzz about this one: It has three levels, culminating in a reservation-only cupola set amid Roman columns. Hello, dream birthday party. Wednesdays, you’ll find us at this tucked away Wicker Park roof deck for dollar oysters. The deal ends at 7 p.m., so—as they say—chop-chop. Taxim’s roof (known as Hayati) is the next best thing to that trip to Greece you keep dreaming about. Aside from the food (Fried cauliflower with whipped goat feta? Yes, please), the candlelight and greenery will have you feeling all kinds of vacation vibes. With DJs spinning until after midnight every night of the week, happy hours tend to go late at this open-air nightclub. It’s available to book for your next work function...just be sure the office gossip mill can handle it. On a summer weekend, this rooftop gets going like Big Star’s patio—only two stories up. Spicy tuna poké bowls and a special daiquiri that changes daily? We’re so in. RELATED: What On Earth Is a Poké Bowl and Where Can I Get One? We don’t know who Bernie is, but we love his Mediterranean-inspired menu, especially those falafel crispies with dill yogurt. Oh, and the timber-lined rooftop isn’t so bad, either.